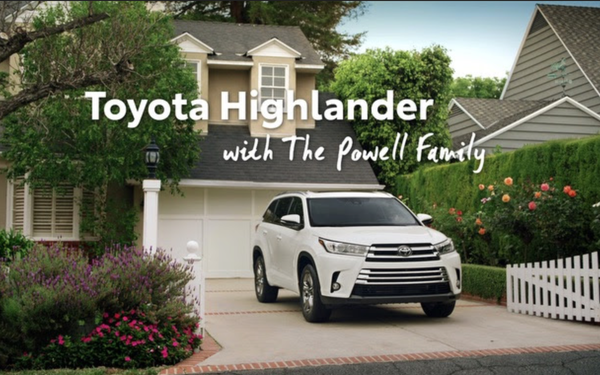 A multiplatform social media and broadcast campaign for Toyota centers around the moments that inspire spontaneous family adventures enjoyed in the comfort of a 2018 Toyota Highlander. Burrell Communications, Chicago worked with The Colonie to create an array of deliverables that include cinemagraphs, GIFs, and square video optimized for Facebook, as well as traditional 16:9. The campaign includes optimizations for Facebook,from Carousels and Canvases to Instagram stories. It features 30-second spots "Inspiration" and "Heroes,"’ which is also airing as a broadcast spot. It also includes a 15-second spot, "Falling" and two 6-second spots, ‘"Jump In," and "Dull Moments." The 15-spot “Falling” finds the family having fun at an indoor skydiving facility. Later the kids share a laugh as they view a video of their dad while charging their devices on the USB ports in the rear of the Highlander’s center console.